A syndrome you know it would surface: a repetitive strain injury resulting from too much messaging (or texting) on your smartphone. De Quervain Syndrome is named after the Swiss surgeon Fritz de Quervain (1868-1940). But this syndrome has a long history, because repetitive actions were once mostly work related. Think of wrist bending and movements associated with the twisting or driving of screws. Workers who perform rapid repetitive activities involving pinching, grasping, pulling or pushing have been considered at increased risk. Nowadays, some specific activities that have been postulated as potential risk factors include intensive computer mouse use and typing, as well as some pastimes, including bowling, golf and fly-fishing, piano-playing, and sewing and knitting. That's why De Quervain Syndrome has a host of other names, such as BlackBerry thumb, texting thumb, gamer's thumb, washerwoman's sprain, radial styloid tenosynovitis, mother's wrist or mommy thumb. De Quervain Syndrome is a tenosynovitis (inflammation) of the sheath or tunnel that surrounds two tendons that control movement of the thumb. Symptoms are pain at the radial side of the wrist, spasms, tenderness, occasional burning sensation in the hand, and swelling over the thumb side of the wrist, and difficulty gripping with the affected side of the hand. The onset is often gradual. 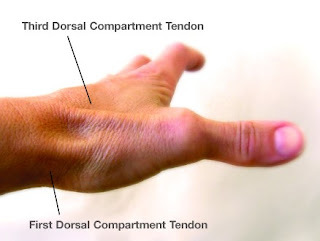 Pain is made worse by movement of the thumb and wrist, and may radiate to the thumb or the forearm. While treatment often includes of corticosteroid injections, research seems to indicate that such treatment may worsen the long-term outcome.